Your clothes dryer is something you use on a daily basis. In the process of drying your clothes, a dryer expels hot air. However, during this time lint and other debris is expelled as well. 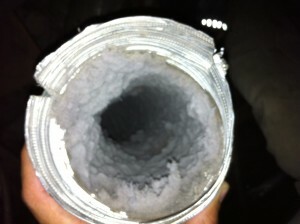 Over time this lint and debris builds up and can clog the vent on your dryer and leading to your exhaust area. Luckily, there is a solution. You can attempt to clean it yourself, but the better solution is having the vent cleaned by a professional. This removes the lint buildup and helps return your dryer to its as-new state. The most common cause of dryer fires occurs when lint builds up in the dryer’s exhaust vent. The lint is flammable and when there is not enough air circulation, the lint can burst into flames leading to a dryer fire. While dryer fires are uncommon, everyone can benefit from having their vent cleaned because of the savings on electric and gas bills. Since the air doesn’t circulate as well when the vent is clogged, the dryer has to work harder to get your clothes dry. A simple vent cleaning can make a big difference in your utility bills. What Does Dryer Vent Cleaning Entail? Residential dryer vent cleaning is a fast process–when you work with a professional. The right equipment and know-how makes the process quick and painless. We approach each dryer set-up individually, and utilize the best method to get it as clean as possible. 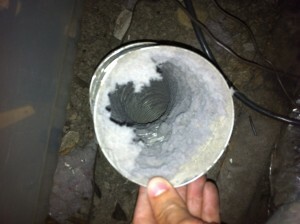 We use both a rotary brush and air basting method based on the set up of your dryer vent piping and the dryer location. When we understand your system and choose the right method, we can reach all bends of the vent and leave the system as clean and lint-free as possible. Now that you understand the importance of dryer vent cleaning, it is important that you find the right company to complete the job for you. Cleanable Solutions serves the entire Chicago Metro area with dryer vent cleaning services–completed with a professional touch. We are dedicated to providing you the service you need at a price you can afford. Call or contact us online and let one of our customer service specialists help you obtain a free quote today. Clean the lint after each use of the dryer. Every 1 – 2 year replace flexible pipe from dryer to wall. Make sure you have good air flow from the dryer vent exhaust exit.